Lighting is often underprioritized, but it plays a critical role in optimizing spaces for functionality and wellness. Think about it: what are your employees doing all day? Job tasks vary enormously and each work style has different office requirements. Jim Luckey, Principal-Director of Design at SHW GROUP, an educational facilities design firm, knows the importance of smart lighting. “Just as workstation arrangement is most efficient when it works with the building structure, locating and designing a lighting system that is aligned with the space plan and functional organization will result in optimizing both the lighting system and the total effectiveness of the environment,” said Luckey. Examples of the lighting solutions implemented in ISCG’s recently renovated Royal Oak, Mich. headquarters. According to Luckey, the seemingly small details of the end user’s work space can make a large difference in employee satisfaction and productivity. The glare of an employee’s computer screen, the color of the walls, and whether or not a space is intended for team meetings are all important factors to consider in lighting design decisions. Luckey explained that general overhead lighting should approximate daytime sun, and that individual task lighting should be there to support more focused activities. He added that collaborative spaces tend to work better with lower light levels and temperatures because they create a more relaxed atmosphere. While everyone should aspire to utilize the maximum natural light available in their space and to strategically install artificial light sources, lighting plans come to fruition in many different forms. Each division in your workplace could potentially have its own unique lighting solution. 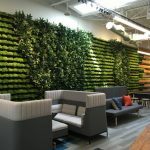 When my firm, ISCG, renovated a rundown Royal Oak, Mich. landmark for our new headquarters, there were several different departmental work styles to address. As a working office and design showroom, it was also challenging to incorporate ambient, task, and accent lighting without sacrificing either utility or artistry. From our designers to sales to accounting, we all had unique task-specific lighting needs that were accounted for in the design of our new space. By starting early in the design process and planning our spaces around the available natural light, we were able to remain energy efficient. 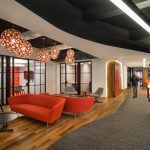 The final implementation included an amalgram of LED direct and indirect overhead lighting with programmable technologies like timers and occupancy sensors, which offer employees the ability to adjust the lighting for different tasks. We also installed specific task lighting to avoid the potential glare, which had been a problem in the clients’ previous office. In addition to this tailored functionality, many companies miss out on opportunities for enhanced aesthetic appeal, sustainability, and innovation when they overlook lighting. Even the most exquisite design, with the best intentions for employee satisfaction, suffers when paired with lackluster, industrial lighting that causes the workspace to feel like a poorly-lit dressing room. New technology has enabled additional affordability and variation in the world of smart lighting solutions. Companies that are about to embark upon a renovation project must prioritize lighting for end users. In already completed spaces, personalized task lighting will immediately improve employee performance and the efficiency of your company. The decision to endorse employee health and wellness begins with taking a closer look at your light. Increasing productivity in workplace design is for certain achieved by specifying better quality light fittings, consideration should be made around the comfort of the light fitting. Sometimes, designers have a tendency to become excited by the look and design of the luminare & forget to check brightness of the fitting, worth talking to professional lighting specifiers and designers…….